Eat and sip your way through Tuscany's famous wine country on a full-day wine tour from Florence by luxury minivan. 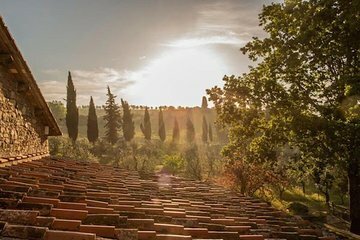 Visit two organic or biodynamic wineries in Chianti for wine and olive oil tastings, a look inside the wine cellars, and a farm-to-table Tuscan lunch. Stroll through the picturesque streets of medieval San Gimignano, and on the way back to Florence stop at a traditional leather factory and the stunning lookout point at Piazzale Michelangelo.